Purchase 630 x 400 pixel digital file by using the Buy Now buttons below. 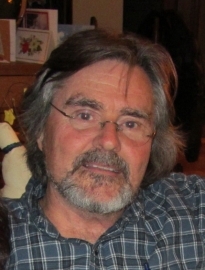 You will receive an email with the download link. You can use the link 5 times to download the digital file. 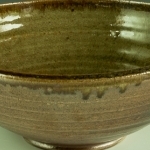 This stoneware bowl was wheel thrown. 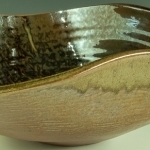 It is finished on the interior with a combination of an orange Shino and a brown Tenmoku glaze. 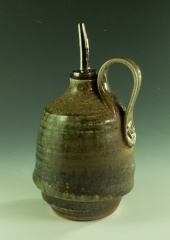 The piece was fired to 2400 degrees F in a wood fueled kiln for about 32 hours and a salt-soda mixture added near the end of the firing. The exterior exhibits the orange peel surface texture typical of salt glazed pottery. Light colored wadding marks typical of the wood firing process are present around the rim where the non-refractory wadding material was used to separate two bowls that were fired rim-to-rim. This rim-to-rim placement also accounts for the slightly out-of-round profile where the clay body settled at the wadding pressure points during the firing. The liner glaze is non-toxic and lead free. 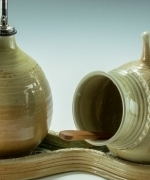 Dishwasher safe..
New artwork uploaded. 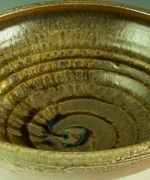 This stoneware bowl was wheel thrown. 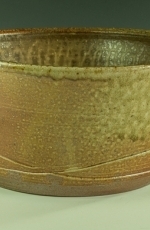 It is finished on the interior with a combination of an orange Shino and a brown Tenmoku glaze. The piece was fired to 2400 degrees F in a wood fueled kiln for about 32 hours and a salt-soda mixture added near the end of the firing. 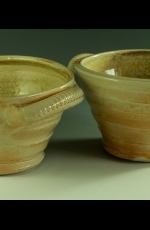 The exterior exhibits the orange peel surface texture typical of salt glazed pottery. Light colored wadding marks typical of the wood firing process are present around the rim where the non-refractory wadding material was used to separate two bowls that were fired rim-to-rim. This rim-to-rim placement also accounts for the slightly out-of-round profile where the clay body settled at the wadding pressure points during the firing. The liner glaze is non-toxic and lead free. Dishwasher safe.